Who would have thought? A cement block is a cement block is a cement block…isn’t it? No longer. Enter CRH with their innovative new block. Why do we have two ears and one mouth?…So that we can listen to our customers and put their needs at the heart of our business. And that’s exactly what CRH has done! Congratulations! As a home owner or renter what eats up your money most here in Ireland? Heating bills? Wouldn’t it be great if there was a way to significantly reduce your heating bills? 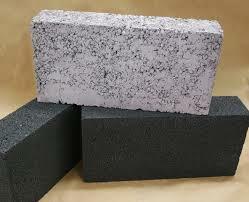 Well now there is…Enter CRH, Cement Roadstone Holdings with their new invention the Roadstone Thermal Liteblock. These purple tinged bricks keep in up to three times more heat than standard concrete blocks, a product which has seen little innovation until now. The brick was invented by the company’s research and development lab based in Dublin. R&D in the construction industry is finally beginning to recover after years of cuts.The bricks can be used to help improve the building energy rating of homes and save consumers money via reduced energy bills. Improvements in energy ratings from A3 to A2 have been calculated for a number of house types using the blocks.The Thermal Liteblocks are designed to be used at key heat-loss points in buildings, called thermal bridging points, such as near ceilings and at floor or basement level. The energy-efficient bricks do not need to be used everywhere, only at specific points in buildings, minimising costs. About 10 to 15pc of the concrete blocks used to construct buildings need to be replaced by new blocks to achieve the required energy efficiencies. Typically a three bedroom semi detached house would require 4,000 concrete blocks. 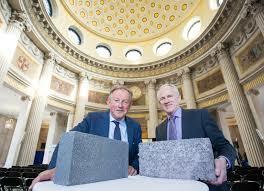 The bricks are 40pc lighter than a standard concrete block which weighs 20kg. They can be treated and handled just like another block and suits traditional construction methods. Roadstone’s 46 Irish quarries have been stocked with the Thermal Liteblock, which will also be available in the UK. Like Glen Dimplex and Greencore, CRH has identified carbon-efficient materials as a growth sector and is investing in research and development in this area. You see….even the cement industry can innovate by putting their consumer at the heart of everything they do. What are you doing to put your consumer or customer at the heart of everything you do? And are you innovating? ← Do you cuddle your customers?